This term we will be reading Zoo by Anthony Browne. What can you tell about the personalities of the four main characters from looking at their pictures above? 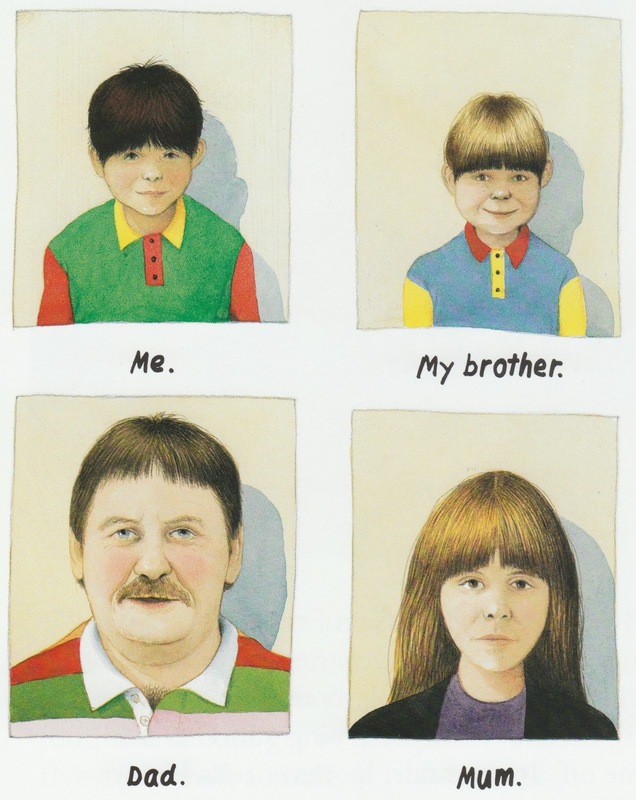 I can tell that they are a family of four because it said,me,my brother mum,and dad.it looks like the two brothers are twins because the clothes just a different colour. The mums face looks very serious. Maybe she is upset about something. She looks worried. The dad looks like he is laughing at something. He could be a joker. The brother looks like he wants to make trouble because he has a grin on his face. The author looks bord. The dad looks like he is laughing, but trying to hold it in. The author looks like his mum. Maybe they act the same. How do you know that from the picture Tremayne? I know that because the brother has a naughty grin on his face. I think the dad had a glare on his face so I can tell he was a little angry and stuff.The Mum looked quite annoyed but she had another fed up face on her self.Harry had a gigantic giggly smile on himself so I ensure he was a silly little boy just like his father. We know harry is very cheeky. He never gets into trouble by dad I alway get in trouble because of him,dad and mum.Dad likes telling all his unfunny jokes.Mum likes silanc and Me and Harry are always bored so we sometimes have a fight. Know one laghes at his jokes because there not funny. I know that the little brother looks very cheeky. The dad looks silly as well. I can tell that the mum is silent and she sometimes talk. I can tell that the dad is a liar because he lied to the ticket man. I can tell that harry always fights with his brother. I can tell that harry’s brother is a little bit kind but he sometimes gets angry and fight with harry. Harry copies his dad. They are both silly and naughty. The author looks like his mum maybe h=they are both sensitive and sensible. Mum: She looks very good and happy but she also looks a bit sad. She is a very sensible person and also very kind. She cares for people a lot and exspecialy her husband and children. She is the most sensible,kindest and most happiest person in the whole family. She is the exact opposite of her husband. Dad: He is selfish and mean. He doesn’t ever care about his own wife or even children. He always thinks about his self. His pink cheeks tell me when he's telling a fib. I have never seen such a mean dad before. When he went to the Zoo with his family he called his younges son a little rat brat. I’v never seen a Dad like this before! He acts so childish. Me: I am one of the most normal person in my whole family. I’m the one who gets in trouble with dad when it’s always Harry’s fault. Harry always makes me get in trouble. I’m sometimes happy,sad,angry,funny or just....normal. So,I have a lot of emotions,don’t I.
Harry: He is the one that everyone finds annoying. He blows raspberry’s at the cars behind them which makes his brother a bit angry. I would not like a brother like him. He acts just like his dad but not as mean. He acts as childish to. Although HE is a child. Very impressive blogging Zyanna! Who do you think Harry takes after? His brother because they aren’t really friends at all. How Harry acts in the story tells me that Harry takes after his brother. The dad always makes bad jokes and embarrasses all of the people and our family. The dad doesn't shere because he didn't share the chocolate bar to his children. Or it's because he ate the chocolate and didn't want them to find out so he said for them not to eat it. The The mum is very quiet it's like she has a sore throat if you would have a cold. She only talked two times in the story that's why am saying that she had a sore throat. The children like being naughty and they always make mischief. Harrys little brother sticks his tongue out from the window when they were driving to the zoo. And Harry was fighting with his little brother I made him cry. Harrys little brother was climbing the pole at the zoo. And the dad said "get off the pole little ratbag! "to Harry's little brother.